Former President George H.W. 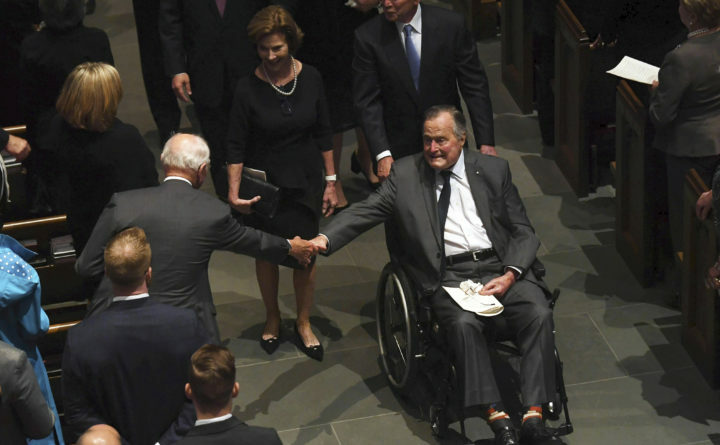 Bush exits the funeral of his wife Barbara Bush, followed by his daughter-in-law former first lady Laura Bush and son former President George W. Bush, at St. Martin's Episcopal Church, in Houston, Saturday, April 21, 2018 . KENNEBUNKPORT, Maine — Former President George H.W. Bush is expected to arrive at the family’s Kennebunkport compound on the Maine coast. Bush spokesman Jim McGrath tells WGME-TV the 93-year-old former president is expected to arrive Sunday. Bush, who served as president from 1989 to 1993, was hospitalized last month with a blood infection after the death of his wife Barbara.